To honor the dedicated nephrology nurses who care for patients with kidney disease, ANNA has designated the second full week in September each year as Nephrology Nurses Week. In 2005, the event will be celebrated September 11-17 across the country with activities recognizing and rewarding nephrology nurses. ANNA has chosen the theme "Nephrology Nurses: Caring for a Lifetime" for this special week. 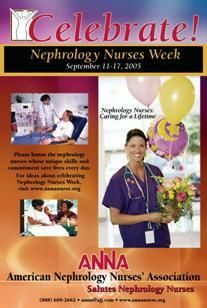 The American Nephrology Nurses' Association (ANNA) has designated September 11-17, 2005, as Nephrology Nurses Week. On behalf of ANNA, I invite you celebrate the specialty of nephrology nursing during this special week. "Nephrology Nurses: Caring for a Lifetime," is the theme for this new week of celebration and recognition. Nephrology nurses touch lives everyday and make a positive difference in improving patient care. Individuals with kidney failure rely on the skills, knowledge, and expertise of nephrology nurses to ensure the safety and effectiveness of their life-saving care. The American Nephrology Nurses' Association is proud to honor nephrology nurses throughout the year, but especially during Nephrology Nurses Week. ANNA applauds all nephrology nurses and recognizes them for their contributions to the profession and to kidney patient care. It's time to celebrate the commitment and dedication that nephrology nurses display everyday on behalf of their patients! Their unselfish work to maintain the health of thousands of individuals with kidney disease is the focus of this special week. I encourage you to recognize the specialty of nephrology nursing. Congratulations to all nephrology nurses!